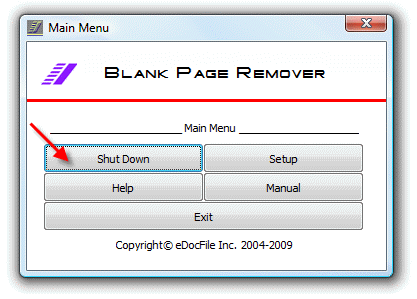 Blank Page Remover from eDocFile, is a utility that is designed for the post processing of tiff images. It is ideally suited for use with a copier that scans tiff images to a file folder on the user's network. The program will monitor a folder and when it finds a tiff image file it will silently open this file remove the blank pages. 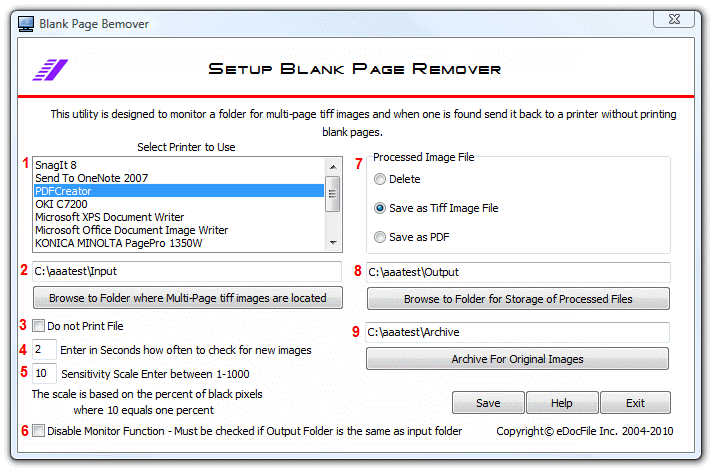 When the pages have been removed the file can be sent to a printer and a copy of the original can be saved as a Tiff or PDF. This provides the user with the ability to quickly copy a mixture of simplex and duplex pages without wasting paper or scan a mixture of simplex and duplex pages without starting and stopping when the page format changes. Begin by opening the program and clicking on "Setup"
The program will search for available printers and then the setup menu will open. 2. Browse to or enter the folder that will contain the incoming tiff images from the copier. 3. If files are not to be printed but only saved with no blank pages place a check mark in this box. 4. Enter a time in seconds to check the folder for new images. 5. Enter a number for sensitivity. Usually this will be between 2 and 3. The scale relates to the percentage of black pixels on the page. Where 1 is 1/10 of one percent. Only testing on your own documents will allow this to be set correctly. An example for testing would be to type a 2 or three letter word on a page. And see when the page is included or dropped. Depending upon the quality of the scan the number maybe as high as 50, but is usually around 10, Keep in mind two things, the dirtier a scanner is the more black pixels it will produce. If images begin to fail processing, either have the scanner serviced or adjust the sensitivity level. 6. Place a check in "Disable Monitor Function" if the program is to be run once and then exited. 7. Select what to do with the processed file, delete it, save it as a Tiff Image or save it as a PDF. Click on Run Program to Start the Program and a flashing Icon will appear in the Sys Tray. To Stop the program click on "Shut Down"
Scan files to the input folder or copy them into the folder. The Trial version cannot be loaded as a service as it prompts the user to continue after each five files. The prompt will not display when run as a service. Instead the program will just stop leading the user to believe that it has failed. If running the program as a service the Main Menu should not be opened or the settings changed. To run it as a service begin by entering the desired settings in "Setup" and save them upon exiting. To change the settings later it must be removed from loading as a Service. Although not an actual service the program can be loaded as one by running it from the command line. 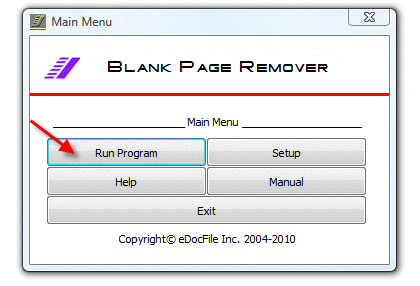 The command line to activate the program is "C:\Program Files\eDocfile\Blank Page Remover\blankpageremover.exe". To make it easier to load the program as a service when the program was installed there was a folder created called "C:\Program Files\eDocfile\Blank Page Remover\Services". In this folder there is a program called "Launcher Service for Windows 2000/XP" which also has worked correctly with Vista and Windows Seven. The license agreement should be read and agreed to before using this program. The file "Readme.txt" contains instruction on how to run the program. 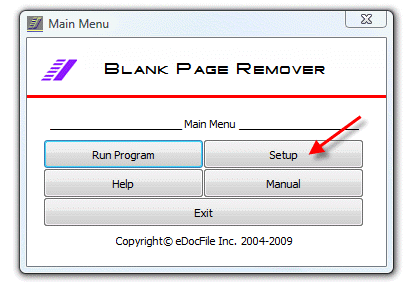 To simplify the process, browse to "C:\Program Files\eDocfile\Blank Page Remover\Services\Install Service.bat" and run it to load the program as a service and "C:\Program Files\eDocfile\Blank Page Remover\Services\Uninstall Service.bat" to remove it from starting as a service. If running it as a service it maybe wise to remove the shortcuts to the Main Menu to stop users from attempting to change the settings.